Why Choose Ron's Service and Towing? -Ron's Towing is one of only six AAA Mountain West vendors to be awarded the prestigious President's Award, as well as the AAA Distinguished Service award. -Ron's Towing was honored to receive the Towman ACE Award from American Towman and their distinguished co-sponsors, GEICO, Agero Motor Club, Coach-Net, and Pinnacle Motor Club. This award is given to the top 1% of service providers nationwide for exemplary service, reliability, and professionalism. -We understand that we could not have received these honors without the help of our customers, and we will continue to work hard to maintain the highest levels of excellence in all aspects of our business. -Ron's Towing has a fleet of eleven trucks that may be used to assist you with virtually every towing or roadside assistance need you may have. We not only provide towing, but we are available for fuel delivery, tire changes, and jump-starts as well! -Our fleet is equipped with six rollbacks capable of hauling a variety of vehicles, from small motorcycles to large 1-ton trucks and vans. -Accidents happen. Whether you slide into another car, or slide into the ditch, Ron's Towing has multiple rollbacks and winch trucks available to assist you. 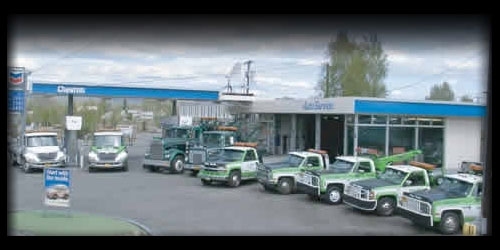 -Being in the towing business for over fifty-five years has allowed us to develop fantastic working relationships with major repair facilities located in Fairbanks and North Pole. Besides being able to collect payment via cash, or credit card, Ron's Towing has the ability to bill some of the shops where you are getting your vehicle repaired. They will attach your towing bill to your repair bill so you can pay for everything at once. -We accept major credit cards, including Visa, Discover, Mastercard, and American Express. -With the ability to bill so many repair shops, and the ability to accept credit cards via phone, we do not require you to be at the pickup or drop-off locations. We only need the keys to tow a vehicle. What does this mean? It means you don't have to wait around for us to show up if you have other places to be. This is really convenient when it is -40 outside. -Ron's Towing also provides complete auto servicing at competitive rates. Our shop is located right in the heart of downtown Fairbanks and boasts experienced ASE Certified mechanics and the professional, personalized service you don't always get with larger shops. -Call (907) 456-4224 or stop by 101 Noble Street to set up an appointment today.